An increasing number of ESL/EFL students are expected to enroll in hybrid (i.e., mixed on-site and online) mainstream courses populated by a majority of native-English-speaking students. However, due to varying language abilities and cultural clashes, the TESOL community has not yet explored the potential online communication problems for ESL/EFL students. 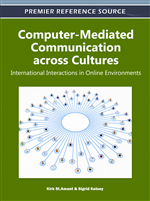 This chapter examines issues of differences in language proficiency and cultural norms, identity, community, and muting that can affect computer-based education. The chapter also provides readers with teaching strategies that can be applied in hybrid mainstream courses that include ESL/EFL students. The recent proliferation of Internet access has led to an explosive growth in the use of hybrid course delivery (i.e., part of the course is conducted online and part is conducted on-site) by a number of colleges and universities. Current estimates, for example, note that between 5% and 21% of all college courses offered in the U.S. are now in some form of hybrid format (Sener, 2003; Allen, Seaman, & Garrett, 2007). Unlike traditional on-site/face-to-face classes held only on campus or exclusively online courses conducted completely outside the traditional classroom, hybrid courses blend elements of both. In hybrid courses, 20% to 80% of face-to-face class meetings are replaced with online activities students complete outside the classroom and on their own time (Kaleta & Aycock, 2004; Kurthen & Smith, 2005/2006; Allen, Seaman, & Garrett, 2007). Yet, unlike participants in exclusively online classes, students in hybrid courses are required to maintain a limited on-campus presence and complete some assignments or activities in person/face-to-face with fellow classmates and in a traditional classroom setting. This on-site/online blend of course offering is predicted to increase as educators worldwide increasingly recognize this delivery method has the potential to offer the higher success rates of online-only courses coupled with the higher retention rates of on-site courses (Aycock, Garnham, & Kaleta, 2002; Duhaney, 2004; Garnham & Kaleta, 2002; Welker & Berardino, 2005-2006). Such thinking has led researchers to proclaim hybrid delivery to be “the best of both worlds: the infinite freedom of the Internet enhanced and made manageable by regular classroom interactions” (Stine, 2004, p. 66). At this same time, the enrollment numbers for English as a second language (ESL) and English as a foreign language (EFL) students in U.S. schools are increasing. During the last two decades, the number of U.S. English language learners (ELLs) over age five has grown from 23 million to 47 million persons – or by an equivalent of 103 percent (Fu & Matoush, 2006, p. 10). Currently, one in every five K-12 students nationwide resides in a household where a language other than English is spoken, and by 2030, this number is projected to double (Urban Institute, 2005). Furthermore, the international education association NAFSA (2007) predicts continued slow growth in international student enrollment in the U.S., with 55% of its surveyed institutions reporting growth. This trend could result in more opportunities for intercultural interaction within U.S. college settings as more ESL/EFL students find themselves enrolled in mainstream classes along with a majority of native English-speaking (NES) students. Moreover, as the growth trend of hybrid educational delivery overlaps with increased ESL/EFL enrollment, it is not unrealistic to expect a higher number of ESL/EFL students to enroll in these hybrid classes. Despite this impending intersection of increased hybrid offerings and ESL/EFL enrollment, the Teachers of English to Speakers of Other Languages (TESOL) education community has not yet opened a discussion of the implications of hybrid delivery for ESL/EFL students in mainstream classes. Some researchers have conducted studies that follow the experiences of students in hybrid ESL/EFL-only courses. (In such courses, ESL/EFL students only encounter other ESL/EFL students vs. in mainstream classes where the majority of their peers will be native English speakers/NES students.) The experiences these students have faced in mainstream classes, however, have been largely ignored. Such an examination, however, is needed now – as the numbers of ESL/EFL students who might participate in mainstream hybrid classes is only starting to increase.